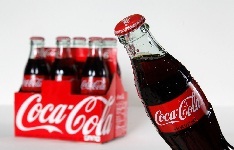 NEW DELHI: Beverages giant Coca Cola will resume operations at its Varanasi plant in Uttar Pradesh following an order from the National Green Tribunal, which today stayed UP Pollution Control Board's directive to close the facility. The order by the Tribunal, however, prevented the company from increasing its production from 600 bottles per minute till it gets a clearance from the Central Ground Water Authority (CGWA). "We welcome today's ruling of the National Green Tribunal that stays the Uttar Pradesh Pollution Control Board's order of closure of the Varanasi Plant. The order reconfirms HCCB's conformance to all applicable laws and regulations in course of doing business," Hindustan Coca-Cola Beverages said in a statement. The plant was shut down earlier this month after the Uttar Pradesh Pollution Control Board (UPPCB) withdrew permission to operate over alleged violation of environmental norms. The single-line plant at Mehandiganj, Varanasi produces soft drinks only in glass bottles and belongs to Hindustan Coca-Cola Beverages Pvt Ltd, the bottling operations unit of Coca-Cola. Hindustan Coca-Cola Beverages had moved the National Green Tribunal, challenging the order of UPPCB. In its June 6 order, the UPPCB had stated that Coca-Cola did not obtain clearance from the CGWA, a government agency that monitors and regulates ground water use in water-stressed areas. The board had said the treatment system at the plant wasn't operated properly and that the company produced more than the permitted capacity by raising production to 36,000 cases a day from 20,000 cases a day. The company's application to the CGWA for increasing its production at the plant has been pending for more than a year. In 2005, the Kerala State Pollution Control Board had ordered closure of Coca Cola's plant at Plachimada.